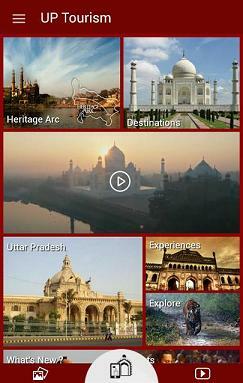 Uttar Pradesh (UP) Tourism launches Official Mobile App on Google Play Store. The features of the application extends from providing basic information about the state, its rich heritage and culture to booking tours and travel directly from the mobile application. Share destinations and monuments over social media and directly to friends and family using mobile native sharing feature. A personal travel guide while your stay in the state. Users can plan their trip, mark places to visit, make bookings via their mobile phone. Information about public utilities like restaurants, ATM’s, hospitals etc. easily available on the go. Get around the city using integrated map based navigation feature. Users can manage their account and your account and rate and review a place of interest after visiting. View upcoming events in the state. Marking favorite places to save them for offline viewing.